Athens is possibly my favorite place on the continent. I’ve been dreaming of the little town for months and it lived up to my most charmed imaginations of the place. Old South feeling mansions and streets, 1930’s-y downtown that’s still busting with little cafes and record shops and students, hip collegiates with darling drawls, and a foodie culture rivaling any big city. Athens is always popping up in food blogs, whether it’s quaint little picnics on the quad complete with mason jars of sweet tea, big slabs of french toast stuffed with the famous peaches, or accolades for the seasonal, local, perfect meals in the town’s multitude of restaurants. There were so many restaurants I wanted to try in Athens, I could have camped out there for days, stuffing myself with soul food and doughnuts. But, alas, we only had an evening and a morning in the town of joy. So I choose Five and Ten for dinner, after reading scores of reviews calling it the very best restaurant in the city. And then also watching the chef’s youtube channel. And reading his blog. And the menus of all his restaurants. And planning my whole life around being his apprentice girl. We arrived at Five & Ten a bit damp after the surprisingly long walk from the hotel, and were glad to sit down at our cozy table beneath a big charcoal caricature of typical restaurant goings-on. The restaurant was just the right amount of crowded, almost every table full, University of Georgia professors laughing and talking over their plates and glasses. Our kind waiter, bedecked in a plaid shirt and complete with just a little bit of that soft southern voice , explained all the mouth-watering specials and helped me decide what to order. Mama and I started with a split of one of the specials; Mario Batalli’s Sicilian Lifeguard Calamari. …I think I saw God. The only word that I can think of to describe the calamari itself is creamy. I don’t know how, bit the little squids were creamy. Cooked in a rich tomato broth, with sweet and spicy and an almost cinnamon-y quality to it, along with hearty chewy barley, which somehow went absolutely perfectly with the whole dish. I’ve eaten a lot of good things. This was one of the best. After that, we did another split, this time of the watermelon feta salad, which I had watched a little tutorial about on youtube, so I had to try it. Layered watermelon and feta, with arugula in a light little vinaigrette and topped with pickled watermelon rind and the thinnest thin slices of serrano chilies. Cool and salty and spicy and good. 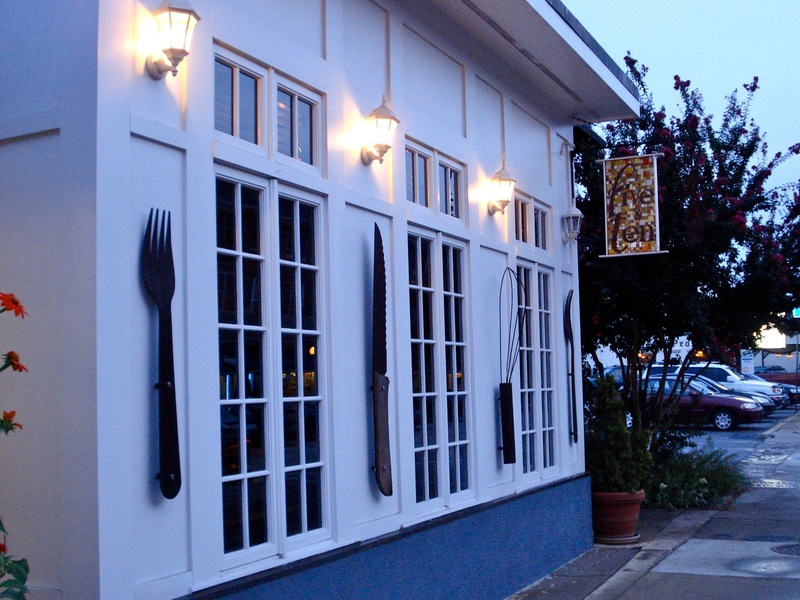 Then for dinner I had the Low Country Frogmore Stew, a leek tomato broth filled with all kinds of good things. Corn on the cob, spicy sausage, shrimp, little fingerling potatoes. Simple and perfect, and presented really cleverly. Mom got flounder, all dressed up in crispy bread crumbs and getting cozy with the sweetest sweet corn, all creamed and good, and some fried tomatoes. And though I was incalculably stuffed by this point, I had to order dessert. The couple next to us had gotten the pistachio cake, topped with a little local fig, and though I couldn’t possibly fit in the cake, I desperately coveted that fig. So I got a scoop of blackberry lavender sorbet and a sweetly-requested tiny fig. Perfect perfect perfect. 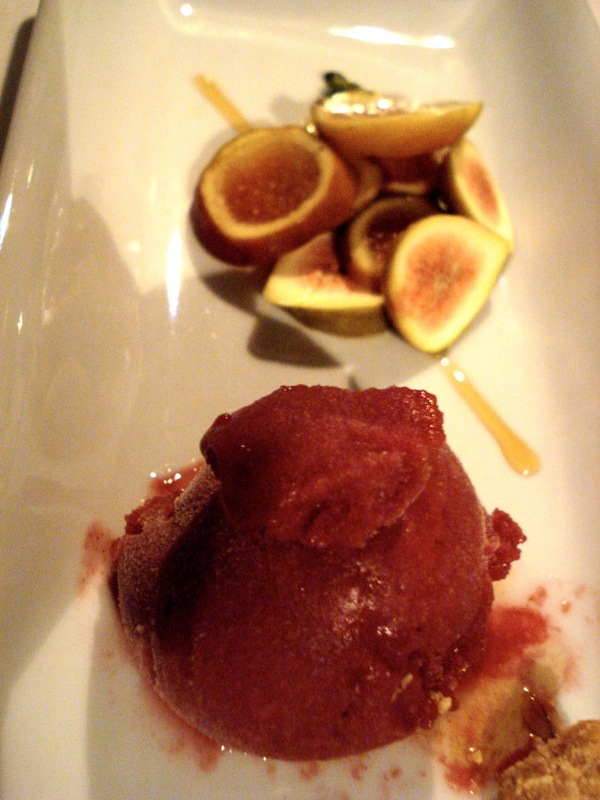 The little fig was sweet and soft and fresh, just as perfect as I had hoped as I oggled the fruit one table over. And the sorbet sort of graceful in a weird personification-of-food way, the lavender calming down the blackberry. It was a heavenly dinner and we left in cloud of food bliss, the long walk home almost effortless. And all the photos turned out awful, so you have to use yer’ imagination. Bran flakes aren’t looking too good right now. Dorm food is… kind of scary. I’ve been living off of yogurt and pasta salad, and the memory of real food. Ha!